This spinoff of a ridiculous (and so fun) CW show has had a gloriously batshit run. 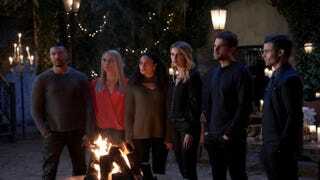 In just 5 short(ened) seasons we saw these anti-heroes put down a werewolf rebellion, destroy an entire chunk of the afterlife, use their mother to kill their evil aunt, oh gosh, there’s so much more. When it’s all said and done, The Originals died like they lived: nonsensical, emotion driven, and having absolutely no clue how to get themselves out of the plot messes they created for themselves. I can’t say I didn’t enjoy it... though I didn’t always understand it. When the Saints Go Marching In marks the end of a decade that these actors have spent playing these roles. They feel.. comfortable, lived-in, almost. I never question the sincerity with which Rebekah whines about her awesome immortality anymore, or the bitterness Kol feels around his family. Even Elijah’s undying devotion to Klaus (remember when he was gonna kill Klaus in tVD season 2?) is just taken as a given... right up to the bitter end. I take that as a sign that this show was just ready to end... these characters had completed their journeys and there was no sense in dragging things out. This finale was meant to be an emotional reminiscence, but in reality it was plot-driven. Legacies is coming in October and we damn well couldn’t have Elijah and Klaus skulking around stealing the spotlight from Hope. Which brings me to my only gripe. I like Hope. I like the actress that plays her. I am entirely unconvinced she can carry her own show. Prove me wrong, Danielle Rose Russell. Prove me wrong. With Caroline & Alaric backing you up you won’t have to try hard. The whole Vincent/Freya/Keelin baby-daddy plot was weird but fitting. Raising a child as an unconventional family seems like a happy ending for that trio. Rebekah finally pursued the Cure again, which is fine. Marcel is as dumb as ever in going along with it but hey, we’ll call that a happy ending too. Caroline’s appearance was brief and poignant. The camera pan to the memorial photo wall at the end was even more so. I am going to miss this show, but I do think it concluded at the right time. The time jump with Hope was smart, the death of Hayley brutal, and the redemption of Klaus was, well, adequate I guess. I mean it’s not a huge stretch for any dad to sacrifice himself to save his daughter... that’s kinda what dads do. It’s not like he went and died for some stranger. He obeyed a basic biological instinct but I guess if Elijah calls that “redemption,” I might as well too. The final scene where they killed each other was gut-wrenching: I kept hoping some witch would come knock them out, or some other ridiculous deus ex machina. But it didn’t happen... I can ignore the stupid “THIS is the last White Oak Stake” nonsense for purposes of the finale... I guess. Niklaus & Elijah faced the great beyond together, and I’m kinda glad that’s how it went down. In the end, The Originals went down strong. I liked the ride, as unsteady as it was, and hope to see Plec & Co. make something special out of Legacies.